The popularity of Luna, especially relative to Celestia, is so established that it’s become a joke within the fandom. The staff of Equestria Daily, apparently sick of her winning every character popularity poll ever, finally released a poll asking if people just automatically voted for her whenever they saw her in a poll. And several more. All these likely contribute, but I think there’s another big reason, and it has to do with the way the two characters are used by the show. 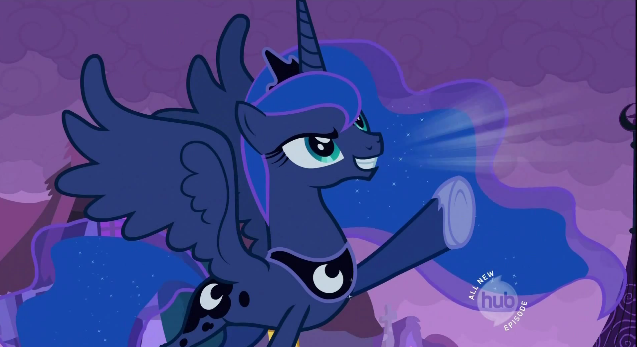 I’m going to make a statement that may sound odd; Luna is a primary character, while Celestia is a secondary character. So where is the dividing line between major and minor characters? There isn’t one. The different levels shade into each other, and as you master the writing techniques appropriate to each level, you’ll be able to create and define each minor character at exactly the level of importance the story requires. Any concise definition will probably be inadequate, but here’s one decent criterion: a character is a primary character if (but not iff) their development is a major focus of the narrative. “Luna Eclipsed” might take place from Twilight’s point of view, and she may have the most screen-time in the episode, but I’d argue that Luna is the protagonist of the episode, since Luna’s flaws and her attempts to overcome those flaws form the basis of the conflict. This is what I think is so impressive about the episode — it depicts a millennia-year-old demigoddess with really sympathetic and relatable flaws (social awkwardness and difficulty being liked). But it does so in a way that is both thoroughly entertaining, and makes perfect sense narratively — she’s been gone 1000 years, of course she’s out of sync with the modern world. 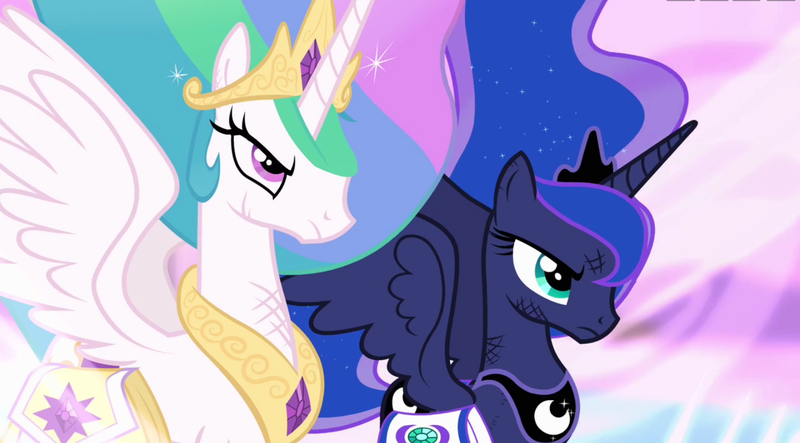 So while Luna and Celestia might have comparable amounts of screentime over the course of the series, Luna’s “character development-to-screentime ratio” is far higher than Celestia’s. This, I think, is a big part of what makes her more compelling. And when she returns in “Sleepless in Ponyville” in the form of a mentor to Scootaloo, her ability to be such a mentor is more satisfying because we’ve seen her struggle to gain that ability. By contrast, we’ve never seen Celestia struggle with her flaws in any major way. People sometimes say she’s boring because she’s perfect, but that isn’t really accurate. We’ve clearly seen her make mistakes, and we’ve seen her fail before. I think the “Celestia is useless” attitude is BS — but this was still pretty funny. It’s not so much that Celestia is flawless, it’s that she doesn’t have any flaws that are uniquely hers (that we’ve seen, anyway). She doesn’t believe Twilight’s warnings about Cadance-Chrysalis, but neither does anyone else. She can’t defeat Chrysalis one-on-one, but neither can anyone else. This means that those flaws aren’t really interesting from a narrative standpoint. I think this may be why so many fanfiction accounts of Luna’s corruption into Nightmare Moon assume some fault on the part of Celestia — she’s a much more compelling character if her flaws have done serious harm to her or her loved ones. But from a narrative standpoint, Celestia’s lack of depth isn’t really a problem. Celestia may be a flat character, but she fills a role that doesn’t need a well-developed character. She’s primarily a demonstration of what Twilight can eventually become, as well as a source of both knowledge and conflict (e.g., Twilight’s fear of disappointing her in “Lesson Zero” and “A Bird in the Hoof”). Luna, by contrast, is used (mostly) as a protagonist in herself. At a certain point, asking “is Luna a better character than Celestia?” doesn’t really make sense, because they’re used in very different ways by the narrative. It’s kind of like asking “is this hammer better than this wrench?”. Also, they’re just freakin’ badass. That’s an important role, too. That said, I’d love to see an episode focusing on Celestia, in which she struggles with her own flaws to overcome some major obstacle. But that might be kind of hard to pull off — any major character flaws would have to be pretty subtle for us to have never seen them. Of course, the fact that it would be hard doesn’t mean it’s impossible. I think one of the more intriguing angles is her propensity for mischief (e.g., “The Best Night Ever”). I like the idea that sometimes she doesn’t take things as seriously as she should, and it would be interesting to see if that’s hampered her before. But that’s just speculation. This entry was posted in Analysis, Storytelling technique and tagged Cartoons, My Little Pony: Friendship is Magic, Storytelling. Bookmark the permalink. I like both Luna and Celestia, but that being said like Luna more. Most for of the same reasons you said. Her design is more appealing to an older audience which MLP has in Bronies. She is easier to relate due to her tortured and venerable nature. Also based on the two part season premiere of four as Nightmare Moon she is more powerful then her sister. Taking her down in just one direct hit by her horn. The only reason Nightmare Moon lost was because her sister used the elements which in my opinion is cheating. In Luna “Eclipsed” like you said Luna has a massive amount of character development that Celestia has never even come close to in four seasons. Luna is better in my opinion by being just a cooler character that anyone can relate to vs. her sister who almost no one can relate to. Its the same reason I like Marvel more than D.C. Comics. Marvel’s heroes are more relatable with Iron Man’s drinking problem, Hulk having to control the beast inside, Spiderman being a teenager, and the nail on the coffin the entire X-Men team. Luna is better for her great ability to relate to anyone.